I mentioned in my “Calling card” post that I have acquired not one, but three different typewriter stamps. Really, I don’t know how this happened. I blame little crafty elves. I used the most-detailed of these stamps for the card below. I also used a lot of embellishments, but the design isn’t overwhelmed because of the card’s length. 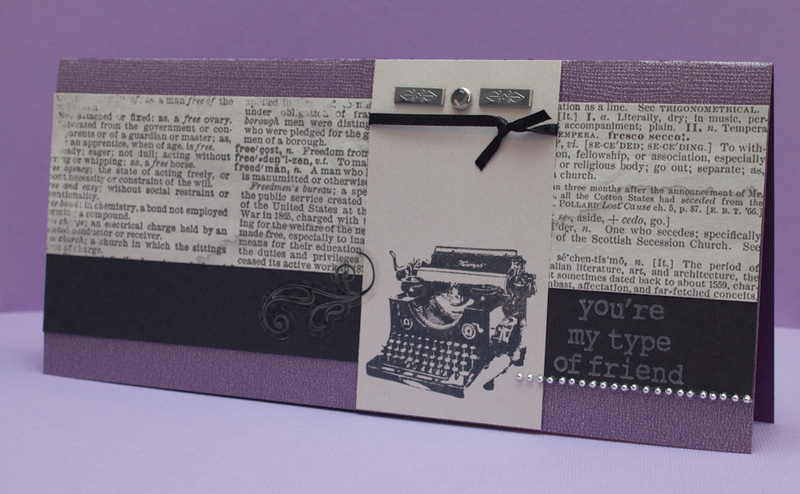 Make a card from an 8-by-9-inch piece of plum metallic textured cardstock. Cut a 3-by-9-piece of black cardstock; adhere to the center of the card’s front. 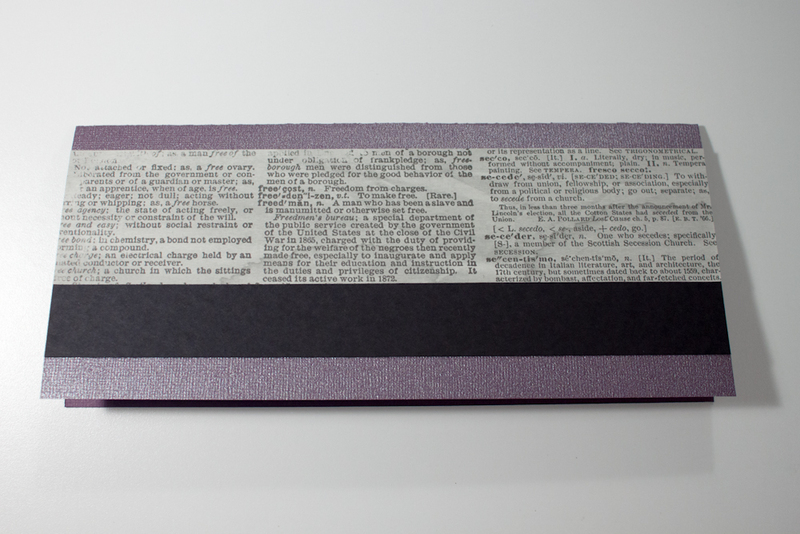 Cut a 2-by-9-inch piece of “dictionary” patterned cardstock (I used Antique Dictionary Page by Bazzill Basics); adhere to the black cardstock, lining up its top edge to the top edge of the black paper. 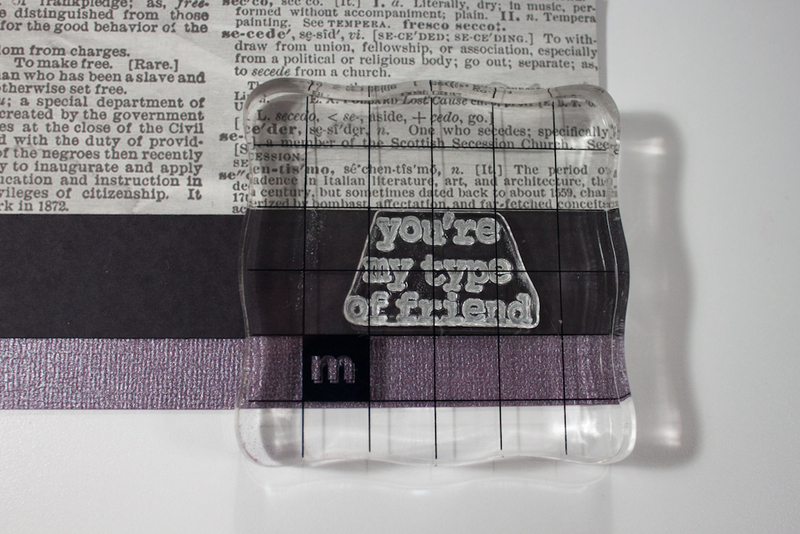 Stamp a sentiment (I used “you’re my type of friend” from Hero Arts Type collection) in light-gray ink (such as ColorBox Petal Point classic pigment ink in pearl gray) in the bottom-right corner of the black paper. Cut a 2 1/4-by-4-inch piece of frost metallic cardstock. Stamp a typewriter image (mine’s from Prima Marketing) in black ink (I used Versafine in onyx black) at the bottom of the cardstock. Attach two staples (I used silver Fastenater staples) to the top of the frost cardstock. Attach a gray jewel-like brad between the staples. Tie a piece of thin black ribbon below the staples and brad. Adhere the entire piece to the left of the sentiment. Attach a strip of small silver embellishments horizontally below the sentiment, from the right edge of the card until it slightly overlaps the frost cardstock. 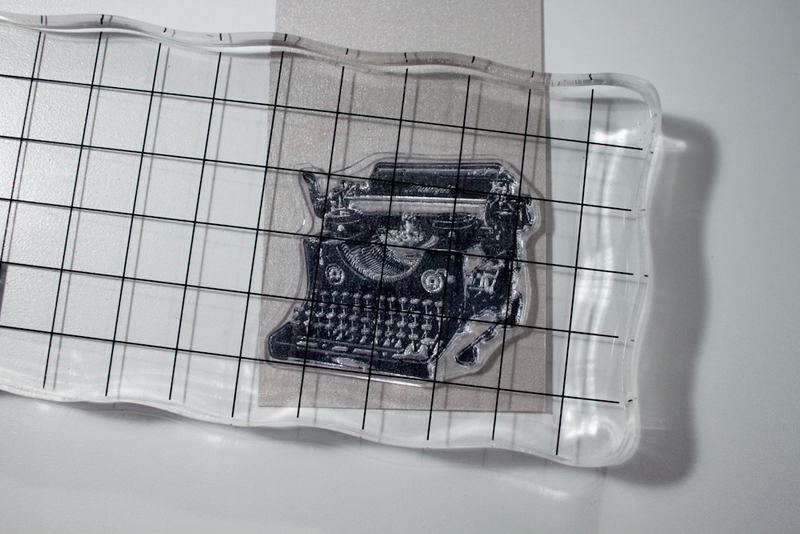 Place a silver scroll sticker (such as one from Me & My Big Ideas Mambi Sticks) to the left of the typewriter image. This entry was posted in Friendship and tagged trends, typewriter, Versafine. Bookmark the permalink.